After ushering in the era of pop-metal with their 1986 blockbuster Slippery When Wet and its hit singles "You Give Love a Bad Name," "Wanted Dead or Alive," and "Living on a Prayer," Bon Jovi wound up transcending the big-haired '80s, withstanding changes in style and sound to become one of the biggest American rock bands of their time -- selling over 120 million albums worldwide and sustaining their popularity well into the new millennium. As the times changed, so did the band's sound. They slowly peeled away the arena rock guitars of the '80s, occasionally scoring on the adult contemporary charts and sometimes singing country music without ever rejecting hard rock, a move that illustrated how they never abandoned their roots and became second only to Bruce Springsteen in defining the sound and spirit of New Jersey rock & roll. 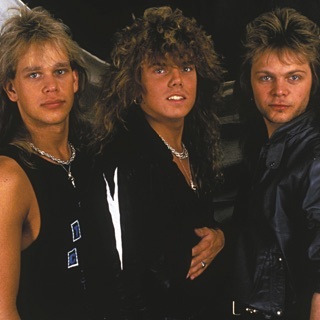 Bon Jovi took their name from lead singer Jon Bon Jovi (born Jon Bongiovi), who spent his adolescence playing in local Jersey bands with David Bryan (born David Rashbaum). Jon's cousin Tony Bongiovi owned the celebrated New York recording studio the Power Station and Jon spent many hours there, working as a janitor and recording demos after hours, sometimes supported by members of the E Street Band or Aldo Nova. 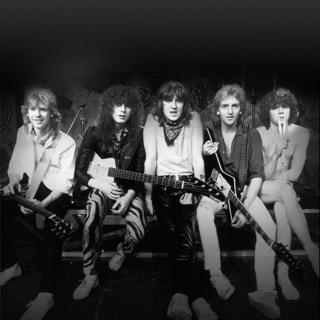 One of those demos, "Runaway," became a hit on local New Jersey radio and led to the formation of Bon Jovi the band, as Jon and Bryan were supported by guitarist Dave Sabo, bassist Alec John Such, and drummer Tico Torres. "Runaway" spurred a major-label bidding war, leading to a contract with Polygram/Mercury in 1983. Before the group entered the studio, though, Bon Jovi replaced Sabo with Richie Sambora, a working guitarist with a long résumé, including a stint as a member of Message. Bon Jovi released their eponymous debut album in 1984, generating a Top 40 hit with the original version of "Runaway." The following year, 7800 Fahrenheit was released and went gold, all serving as a prelude to the band's 1986 breakthrough, Slippery When Wet. Paul Stanley had given Jon and Richie the phone number of professional songwriter Desmond Child, and together they wrote two of the album's biggest hits in Richie's parents' basement. The trio composed 30 songs in total and auditioned them for local New Jersey and New York teenagers, basing the album's running order on their opinions. 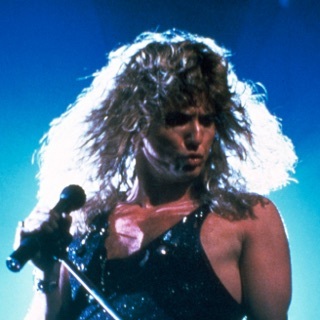 Supported by several appealing, straightforward videos that received heavy rotation on MTV, the record took off on the strength of You Give Love a Bad Name, followed quickly by "Livin' on a Prayer" and "Wanted Dead or Alive." Those three Top Ten Hits helped propel Slippery When Wet to sales of nine million in the U.S. alone, establishing Bon Jovi as superstars in their home country. Their fame was not limited to the U.S., though, as the album also turned into a significant hit in Europe, Canada, Japan, and Australia. Bon Jovi built upon Slippery When Wet's formula with 1988's New Jersey, which shot to number one upon its release. New Jersey was only slightly less successful than its predecessor, selling five million copies and generating two number one singles, "Bad Medicine" and "I'll Be There for You," as well as the Top Ten hits "Born to Be My Baby," "Lay Your Hands on Me," and "Living in Sin." 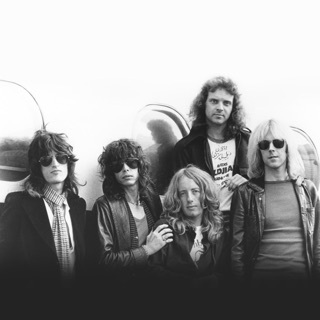 Following the completion of an 18-month international tour, the band went on hiatus. During the time off, Jon Bon Jovi wrote the soundtrack for Young Guns II, which was released in 1990 as the Blaze of Glory album. The record produced two hit singles -- the number one title track and the number 12 "Miracle" -- and earned several Grammy and Oscar nominations. The following year, Bon Jovi reunited to record their fifth album, Keep the Faith, which was released in the fall of 1992. While the album didn't match the blockbuster status of its predecessors, it did produce a hit with "Bed of Roses," an adult contemporary-styled ballad that helped sustain the band's popularity. A greatest-hits album called Cross Road appeared in 1994 and yielded another Top Ten ballad, "Always." 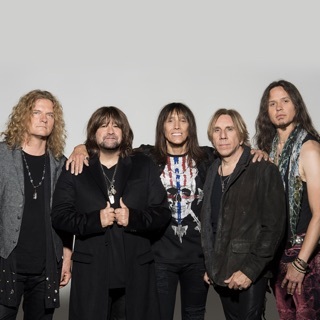 Around the same time, bassist Alec John Such left the band; Hugh McDonald, who appeared on Bon Jovi recordings stretching back as far as "Runaway," became his unofficial replacement and featured prominently on the band's next album. Released in the fall of 1995, These Days turned into another U.S. Top Ten, as well as a popular European hit. After appearing in the 1996 film Moonlight and Valentino, Jon Bon Jovi released his first official solo album, Destination Anywhere, in the summer of 1997. During the tail end of the '90s, the members of Bon Jovi engaged in different projects -- Sambora released a sophomore solo set called Undiscovered Soul in 1998 -- before easing back into work in 1999 via a song for EDtv, then beginning work on a full-length record. The resulting album, Crush, appeared in 2000 and constituted something of a comeback in America thanks to the smash single "It's My Life," a cross-platform hit single with long legs. "Thank You for Loving Me" also turned into a hit, helping Crush go double platinum in the U.S. and selling eight million copies worldwide. Bon Jovi quickly followed Crush with their eighth studio effort, Bounce, which appeared in fall 2002, and supported the record with another international tour. In 2003, the band re-recorded many of its most well-known songs for the acoustic-based release This Left Feels Right, which also saw an accompanying DVD in 2004. The ambitious outtakes and rarities box set 100,000,000 Bon Jovi Fans Can't Be Wrong arrived in November of that year, followed by the all-new Have a Nice Day -- the first of several albums produced by John Shanks. That album's success was aided in part by the single "Who Says You Can't Go Home," featuring guest vocals from Sugarland's Jennifer Nettles, which eventually won the Grammy Award for Best Country Collaboration with Vocals -- as well as topping the charts in Japan, Australia, Europe, and Canada. The band spent the following year in the studio, putting the finishing touches on a collection of pop-infused heartland country anthems. The resulting Lost Highway, which featured duets with LeAnn Rimes and Big & Rich, arrived in the summer of 2007 and grabbed the band a healthy new country music fan base in the process. Lost Highway's cross-genre formula proved to be quite potent, securing the band its third number one album in the U.S. Bon Jovi returned to rock shortly thereafter, though, with the release in 2009 of a somber, searching album titled The Circle. One year later, Greatest Hits: The Ultimate Collection offered plenty of hits along with two new tracks, "No Apologies" and "What Do You Got?" In the first years of the 2010s, the members of Bon Jovi pursued solo projects, the most notable being Sambora's 2012 solo album Aftermath of the Lowdown. In November 2012, two months after Sambora's album, the band issued Inside Out, a live album for video, recorded at London's O2 Arena, New Jersey's MetLife Stadium, and New York's Madison Square Garden. In March of 2013, Bon Jovi returned with What About Now, their first studio album in four years. In similar thematic and musical company to The Circle, it reached number one on the Billboard Top 200, along with topping the charts in Australia and Canada and reaching two in the U.K.; despite its high debut, What About Now was their first album to not reach gold certification in the U.S.